A new app, brought to you by the maker of Zyrtec and Tylenol, combines information from doctor’s offices, Google searches, and social media mentions to tell you whether illness is creeping closer to you. 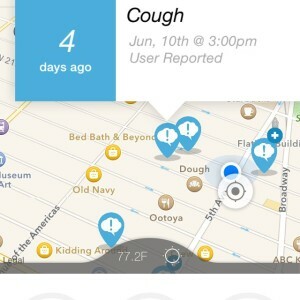 HEALTHYDAY has a location-based warning system for three things: allergies, cold, and flu. The creators compare the app to crowd-sourced traffic apps like Waze…but in this case it’s for health. Want a musical time machine? Spotify has you covered. If you give Taste Rewind “three artists you love” from a wide-ranging selection, Spotify will create four different playlists for you. These playlist represent different decades—the ‘00s, ‘90s, ‘80s, ‘70s, and the ‘60s. You can preview the first song, share them, or add them to your account. Engadget’s editors gave it a try and had good results…but some of the commenters did not. You’ll just have to try it for yourself, I guess :-). For a while folks have been speculating Apple is developing a larger iPad and now there’s reason to believe those guesses were well-founded. A developer found a larger keypad hidden in the iOS 9 beta. Note that this version has the numbers and symbols right at the top, rather than having to toggle to get to them. The press is calling this yet-to-be-released iPad the “iPad pro” and it’s expected to come later this year. If you’re old enough to remember Amiga computers, you might be surprised to know at least one is still around…and operating a pretty key system in the Grand Rapids Public School District. Their heating and cooling system is run from a Commodore Amiga computer using a 1,200 baud modem. Even funnier? A high schooler wrote the original code, so they have to contact that person who now is old enough to have kid at the high school, when something goes wrong. Apparently they hope to upgrade the system soon, assuming a bond proposal is approved. Of course, this was before the Uber ruling in California, but this week the Wall Street Journal reported Amazon is considering paying average folks pick up packages from a drop spot and deliver them to their final location. The report says the program is being referred to as “On My Way.” The company did not comment on the WSJ story, however, given that Amazon’s shipping costs are growing faster than revenue, a move like this would make sense. The new Paperwhite has a 300 pixel-per-inch screen, equal to that of the Kindle Voyage (although that one has more contrast and a brighter screen). Amazon won’t be charging any more for this new, updated Paperwhite. It will still retail for $119. In addition to a fantastic new screen, Paperwhite displays Amazon’s new font called Bookerly. It was designed specifically for reading on their e-readers, and combined with iOS updates that displays the text more smoothly (it even uses hyphens instead of having awkward gaps! ), it makes for a better reading experience. This week it was announced that as many as 600 MILLION Samsung phones are/were vulnerable to a keyboard exploit that could give hackers the ability to install malware. Samsung noted it would take quite a perfect set of conditions for a hacker to make it in (and, there have been no reports of it actually happening). But still, they’re working with SwiftKey to roll out a firmware update. Samsung says to make sure you’ve got the most current security, go to Settings >Lock Screen and Security>Other Security Settings>Security policy updates and make sure Automatic Updates has been activated. TheVerge tested all the latest models by creating a pop-up coffee shop in a conference room. They appear to have tried at least 10 different makers, ranging in price from $350 to $92. They have declared the Best Coffee Maker You Can Buy as the Bonavita 9-cup Brewer with Stainless Carafe. It could make a great last-minute Father’s Day idea, if you still need one. If you reserve your Apple Watch online, starting this month, you can pick it up in the store. Creatively called, “Reserve & Pickup” you can do exactly that. This week PC and console gamers united for the E3 game developer conference to hear what’s new and what’s coming. There were some big announcements including a Minecraft and HoloLens pairing that’s apparently awesome, some new games including Fallout 4, Halo 5, Call of Duty: Black Ops III, and Rise of the Tomb Raider are expected by the end of the year, but Sony might have just “won” the event with its big news. Xbox One will soon be backwards compatible with more than one hundred 360 games. It is now, for select players, and the feature will be rolling out for all by fall. Engadget can tell you how that’s going to work.